Introducing my 1st Sugar Lips Apparel post as a Fashion Blogger Contributor. I applied within their fashion blogger program nearly 2 months ago and just received my gift! If you don’t know much about Sugar Lips, they are a clothing company specializing in girlie, trendy and edgy fashions. Not only are their clothes available online worldwide, you can also find their apparel in Macy’s, Dillard’s and Nordstrom’s. Made from quality fabrics and seamless edges that make it possible for all of us to enjoy them at affordable prices. 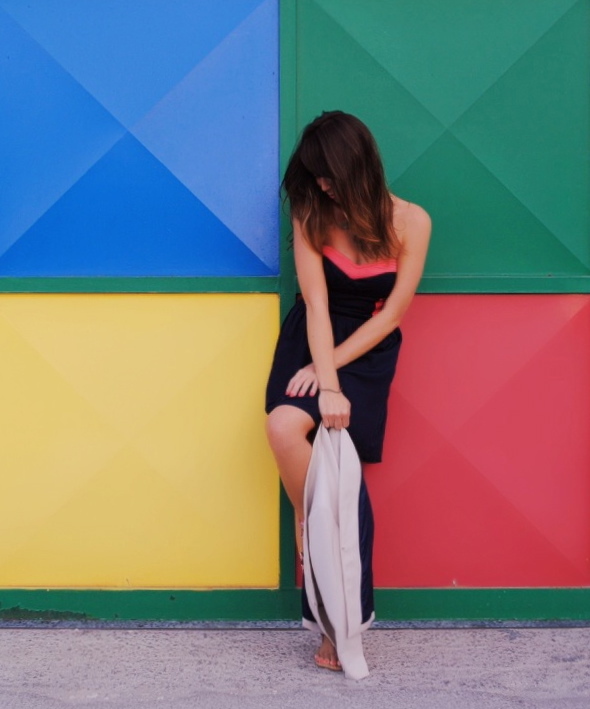 I had a great time wearing this awesome color-block dress which is still very much in trend! Didn’t I find the perfect painted gate? The midnight color fabric clung nicely and the coral patch work seamed in perfectly giving my body more curve appeal. I paired it with my Motivi Sandals and floral sunnies you’ve seen in a couple of my previous OOTD posts. It’s still hot over here! So go on, check out their website, support me while supporting Sugar Lips! Thank you Sugar lips! Jen!!! you look amazing!!!! i love those sandals! they are so colorful and Miami style!! Cute dress! Loving the backdrop though, perfect place for colorful shots! Lovely post!You look so cute! Cute dress, sandals and sunglasses – love the backdrop . . .
Adorable! Love the strappy sandals too! You look gorgeous!!! Love your dress!! Thank you thats my Hubby’s favorite look as well. 🙂 Have you heard of sugarlips apparel before? Amazing!!! What kind of camera do you use? As usual fantastic, look, fantastic photos. How fun!!! Love the dress and the accessories. Just perfect! Love your dress!! You look fab!! Thank you, hope you check out Sugar lips website! I’m looking forward to your next post! Thanks. My hubby said I reminded him of Zoey Deschanel in this dress. LOL. This is her style, very cute and flirty. Anyhow, I picked 3 different looks and this was the one Sugar lips choose for me. Thank you! This trend is color block so it was fitting! What a cute dress!! I love the colors. It fits you perfectly.